My full 28 day itinerary is listed below in sections – feel free to click on what interests you, however if you click on the top-most item, there are links at the bottom of each page to take you to the next destination – from beginning to end. This is the best way to explore the whole trip using my detailed travelogues. 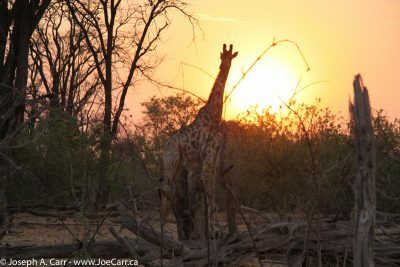 If you just want to read about safaris and see photos of the animals, be sure to explore all of the links under Botswana, Kruger National Park and Hluhluwe-Imfolozi Game Reserve under South Africa. If you don’t want to read my travelogue, go straight to my photos and videos to skip all the words! 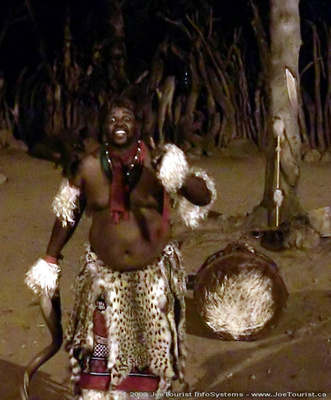 My trip to four countries in Southern Africa began as a 11 day Botswana safari package offered by TravelQuest International, a US-based tour company who specialize in astronomy-related travel. I had previously booked a Costa Rica “Southern Skies” tour with them earlier in 2008, and I was looking around to make arrangements for an African safari in 2009. TravelQuest and their partner Wilderness Travel offered a safari tour to Botswana and Zambia in October 2008 – a bit earlier than I had wanted to go, but I trusted their ability to put together a well-planned tour, so I booked Botswana Under African Skies Safari. A few days after booking this tour, it started sinking in just how far away Southern Africa is from where I live on the west coast of Canada. When I researched the airfares, I knew I would be traveling for about 30 hours. Now I’ve traveled by air on long segments before, so I knew I would survive without a problem, but I wanted to make this travel marathon count. Having a 11 day tour and then returning home just didn’t make sense to me, so I started researching to see what was available as an add-on. 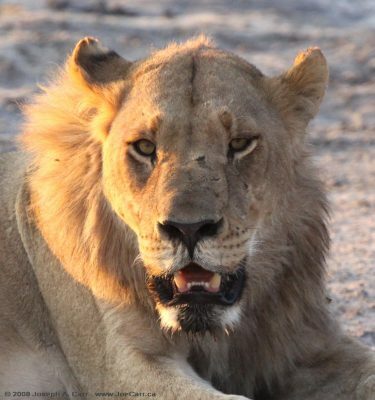 I initially thought that Namibia would be ideal, since this country is right next to Botswana, it has some very interesting sights to see, and there are daily air connections – however I couldn’t find a tour that dovetailed with my Botswana safari. I eventually found a tour of South Africa that appealed to me, and which left Johannesburg the day after I returned from Botswana. Thompsons Africa South African Surprise was a driving tour from Johannesburg to Cape Town down the Wild Coast and the Garden Coast, with diversions to Kruger National Park and other interesting sights along the way. This appealed to me because it offered a nice counterpoint to the Botswana safari – going from Land Cruisers bouncing wildly in off-road adventures to an air-conditioned tour bus on paved highways; and from sleeping in tents at camps without electricity or running water to nice hotels and resorts with all the amenities. This tour was 15 days long, meaning I would be traveling for a total of four weeks before returning home. That certainly made enduring those long flights worthwhile, so I booked it. I had another important reason for booking a second tour. Travel costs in Botswana are very high. As I understand it, when the Botswana government decided to get into eco-tourism in a big way about 20 years ago, they made a strategic decision to appeal to the high end travel market. Although I booked a basic safari, it worked out to cost $640/day when airfare was included. Travel costs in South Africa are about one third the travel costs in Botswana, so by booking the South African tour, my travel was now costing about $340/day. Of course, I was also spreading out my airfare cost over 28 days instead of 11 days, which helped to justify spending more to do more. Another justification in my mind is that I ‘m unlikely to return to this part of Africa for awhile, so I wanted to cover as much territory as possible while I was there. Day trips to game reserves such as Kruger National Park, Hluhluwe-Imfolozi Game Reserve (both in NE South Africa), or the Chobe River Boat Cruise (in Zambia). These types of safaris offer full facilities and convenient rest stops (or comfort onboard a boat), paved roads (or calm waters), and easily accessible game that are conditioned to be fearless of people in vehicles and vessels. It gets crowded at game observing locations, but these type of safaris are very productive as far as seeing and photographing lots of game in only a few hours, and at very close range. The bus tour I took from Johannesburg to Cape Town was a superb trip as well, but as pointed out in “How it evolved” (above), this was a very different travel experience. I was in a bus with 40 other people for two weeks. The group was mostly composed of British travelers, with some other Europeans as well. I was the lone traveler from North America. We drove some 4,500 kilometres, all on paved roads. We obviously covered a great deal of ground, and experienced many of the major sights that South Africa has to offer. I enjoyed interacting with my fellow travelers – comparing notes at meal times or during breaks. Being a single traveler, I sat with a variety of people in the bus. Some wanted to talk, and others just wanted to sleep or read. I was ready for more human interaction on this segment of my travels, since there was only one other person who traveled with me on the Zambia/Botswana safari. A nice bonus were the cultural experiences along the way. Overall, these arrangements worked out well for me. The counterpoint between the South Africa bus tour and the more rough-and-ready travel in Zambia and Botswana made the four weeks very interesting and varied. Yet, by the time I reached the end of my travels in Cape Town, I was ready to return home.